What Day Of The Week Is July 23? 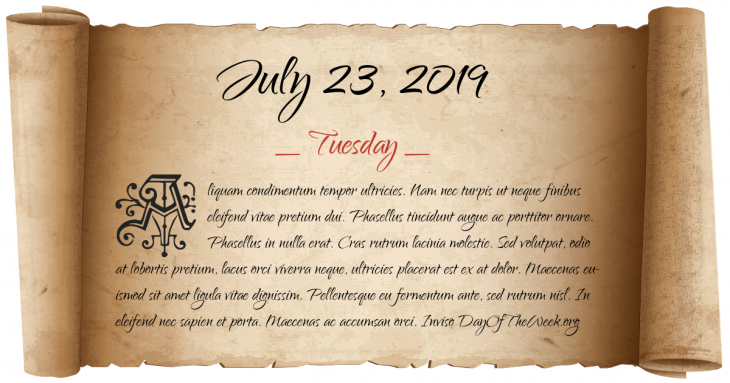 July 23, 2019 is the 204th day of the year 2019 in the Gregorian calendar. There are 161 days remaining until the end of the year. The day of the week is Tuesday. Prussia re-conquers Mainz from France. 12th Street Riot: in Detroit, Michigan, one of the worst riots in United States history begins on 12th Street in the predominantly African American inner city. It will leave 43 killed, 342 injured and 1,400 buildings burned. The only successful hijacking of an El Al aircraft takes place when a Boeing 707 carrying 10 crew and 38 passengers is taken over by three members of the Popular Front for the Liberation of Palestine. The aircraft was en route from Rome, Italy, to Lod, Israel. The United States launch Landsat 1, the first Earth-resources satellite. The International Whaling Commission decides to end commercial whaling by 1985-86.
Who were born on July 23?